8.6" x 7.1" stitched on 14 count. 6.7" x 5.6" stitched on 18 count. 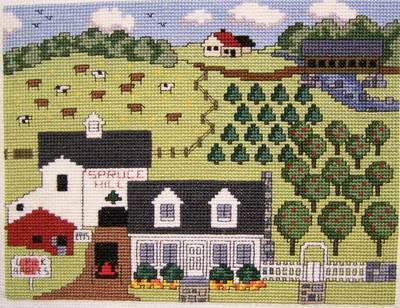 Spruce Hill Farm cross stitch pattern... An "Americana" farm scene which might be typical of those found in central Ohio, USA. where Amish farms are common.